When chronic pain comes from the nerves, these nerve pain medications can help when added to other pain relievers. For chronic muscle and joint pain, effective therapies include rest, ice and heat, anti-inflammatory medications, and time. Usually, the pain calms down and you feel better. However, muscle and joints may be only part of the picture. For instance, pain can be coming primarily from irritated nerves , along with the injured and inflamed muscle or joint. Often the discomfort is only arising from nerve pain. Typical signs of this "neuropathic" pain include sharp, stinging pain or pain that radiates from one part of the body to adjacent areas. One of the most common causes is diabetes, although it can also be brought on by injury, infection, and some medications. "People say things like, 'My knee hurts and I feel like it's coming up to the middle of my thigh and down to my shin," says Dr. Padma Gulur, a pain medicine specialist at Harvard-affiliated Massachusetts General Hospital. "In those cases, the nerve may be involved." In neuropathic pain, the nerve that was the mere messenger of pain now becomes the actual source. Narcotic pain relievers don't often help and even when they do, they should not be used as a long term solution. Fortunately there are other options. Certain drugs that were originally developed to treat depression and seizure disorders also damp down inappropriate or excessive pain signaling in the nerves. A variety of drugs can be added to conventional pain relievers to reduce nerve pain. Adding one of these nerve pain medications won't completely take the pain away, but it may help. Anticonvulsants: These medications were developed to control seizures, but they also help to blunt pain signals in the nerves. Several are in wide use for chronic pain (see "Medications for nerve pain"). It takes about three to four for the full effect to kick in. Your doctor will usually start you on a low dose and gradually increase it. That reduces side effects. • Tricyclic antidepressants, such as amitriptyline (Elavil), doxepin (Sinequan), and nortriptyline (Pamelor). These drugs are prescribed for pain at doses lower than are effective for depression. • Serotonin–norepinephrine reuptake inhibitors (SNRIs), such as duloxetine (Cymbalta) and venlafaxine (Effexor). SNRIs have fewer side effects than tricyclics, although some research suggests they may be less effective. • Selective serotonin reuptake inhibitors (SSRIs), such as fluoxetine (Prozac), are the most commonly prescribed medications for depression. Some doctors may try these for treating nerve pain, too, but the evidence for effective pain relief is mixed. Nociceptive (body) pain comes from damaged tissues outside the nervous system, such as muscles and joints. People say the pain feels aching and throbbing. 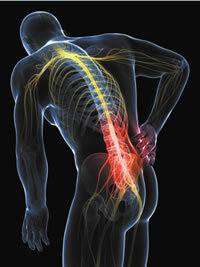 Neuropathic (nerve) pain comes from the nerves that transmit pain signals from the body to the brain. People describe the pain as burning, stinging, or shooting. It may radiate from one area of the body to another. It may be accompanied by numbness and tingling. Doctors usually try one type or the other (antidepressants or anticonvulsants), although they can be combined. They are taken daily in addition to conventional pain relievers.